The Fighter/Attack series is one most people are familiar with, and probably the most well-know set of aircraft the Unites States Navy and Air Force produce. Unfortunately, the understood distinctions between each aircraft are not that well known. Most commonly, all fighter aircraft are referred to as an F-16. If you don’t believe me, just look up a few YouTube videos; you’ll be able to see variances in the details of the aircraft, but most of the videos are will call the aircraft an F-16 … it’s sad, really. Let’s talk about the second most awesome plane in the Fighter/Attack series (the most awesome being the Lockheed Martin F-22 Raptor, but this aircraft, unfortunately, will not be at the Quad City Air Show): the F/A-18. And, just to make things interesting, let’s Tarantino this post and get to the interesting stuff first! If you recall, the Fat Albert of the Blue Angels was a C-130. 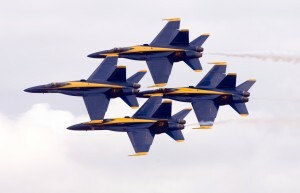 Well, the most recent bread of Blue Angels themselves happen to fly F/A-18 Hornets. That’s where this post comes in as relating to the Quad City Air Show—not only will their be ground displays of a standard F/A-18, but the Blue Angels will put on a show flying their F/A-18s as well. The media? F/A-18s have made appearances in the following popular Hollywood movies: Godzilla (I’d say the scene is obvious enough), The Rock as they attack Alcatraz, Independence Day (the aircraft that Will Smith is shown flying), Clear and Present Danger where an F/A-18 is shown dropping a laser-guided bomb on a vehicle, Tears of the Sun in the final battle, and the F/A-18 Super Hornet, a two-seat variant of the F/A-18 Hornet stars, in Behind Enemy Lines. Think you saw the F/A-18 in Transformers? You’d be right! The Transformers Decepticon, Starscream, morphs into an F-22 Raptor, and flying through the city (when Starscream smashes them down) are also F-22s. However, the fighters shown lifting off the carrier part-way through the movie are Hornets, and I actually know the pilot who was flying the F/A-18 shown taking off from the carrier! Ever seen that video of a fighter jet flying and safely landing after losing a wing? That’s an F/A-18. The Hornet was the first aircraft of its kind to have the unique ability to be able to safely fly with up to 80% of a wing removed, thanks to some amazing thrust-control software developed by … you guessed it, Rockwell Collins. I’m not 100% certain, but I believe that functionality has also been implemented in the F-22 Raptor. Finally, the F/A-18 is one of the most common fighter jets you see at an airshow, next to the F-16 Fighting Falcon and the F-15 Eagle, so it’s likely that if you’ve been to an air show or two, you’ve probably seen the Hornet or a variation thereof. 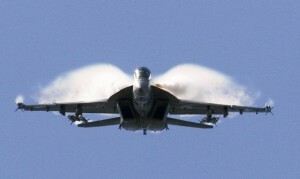 The F/A-18 is powered by two massive power plants mounted on its rear. 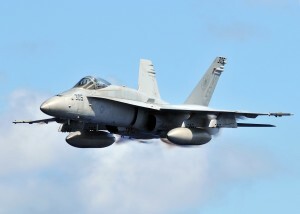 The power plants are each F404-GE-402 afterburning engines, capable of thrusting over 18,000 pounds.The weight of the F/A-18 at takeoff is 22,000 pounds. The thrust-to-weight ratio is nearly 1-to-1, which lends to the aircraft’s amazing maneuverability. The fighter can hold over 11,000 pounds of fuel in its internal tank and nearly 7,000 pounds in its external fuel tank. On takeoff, the aircraft will be loaded with different amounts of fuel depending on its roll during flight. For instance, if it is performing an attack mission, the external fuel tank will not be filled. However, if is performing a longer-range attack mission, the external fuel tank will be filled, and the plane may weigh up to 52,000 pounds on takeoff. 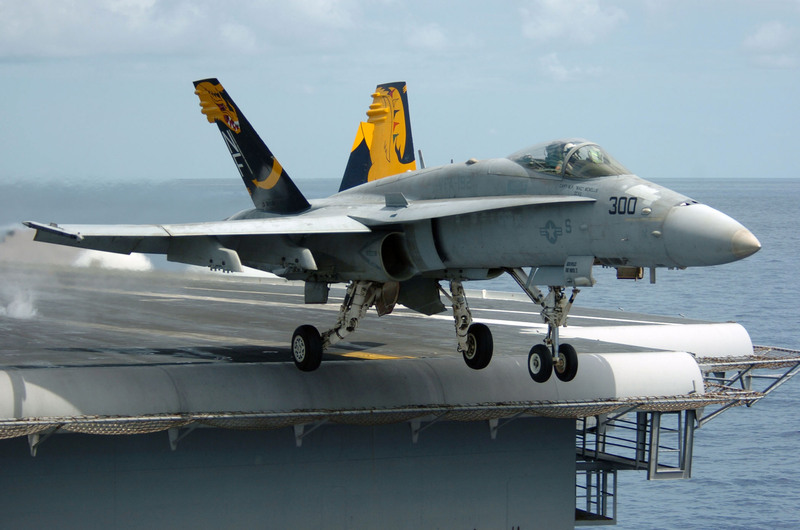 The Hornet is 56 feet in length, only 15 feet in height, and has a wingspan of 40 feet—again, its very close length-to-width ratio lends to amazing maneuverability during combat. When loaded with fuel and missiles, the fighter can fly just over 1,000 miles non-stop. It’s hard to talk about a fighter jet without touching its speeds. You ready for this? 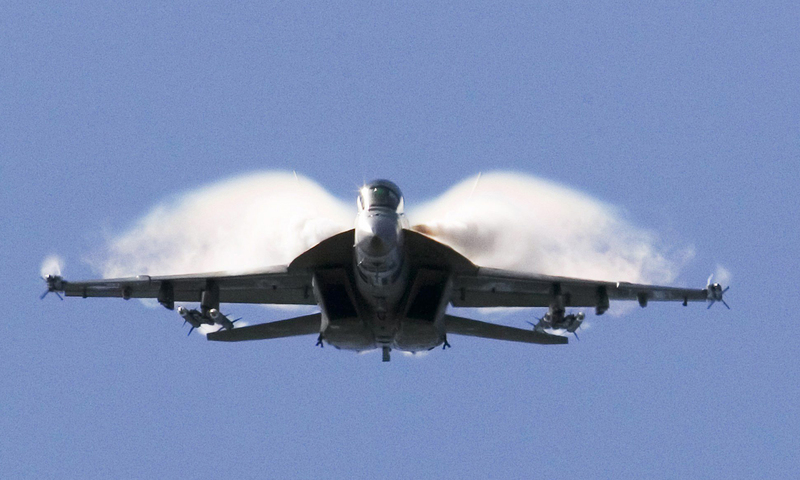 The F/A-18 has a top speed of mach 1.8—that’s 1,370 mph. That’s less than two hours to fly coast-to-coast in the United States at its widest point (excluding Alaska, of course). And while we’re on the subject of dimensions and speed, we should probably talk about the planes use on aircraft carriers, since it was designed with that storage in mind. Certain later F/A-18 models (E and F) have collapsible wings for better storage on an aircraft carrier, but the standard models (A-D) do not. This isn’t a huge issue, however, since their wingspan is only 40 feet. Carriers range in size, but depending on the mixture of aircraft its holding and whether they have collapsible wings or not, a carrier can usually hold anywhere from 85 to 140 fighter planes. Fighter jets, though extremely powerful, do not have enough thrust to get their aircraft up to liftoff speed before the end of the very short carrier runway, usually around 300 yards or less. By comparison, United States air regulations require commercial landing strips to be a minimum of 4,033 yards. So you can see that the fighters are working with a lot less runway here. So how do they get up to speed? Four continuous catapults. A plane cannot lift off the ground until the proper amount of air is moving over the wings to generate lift. 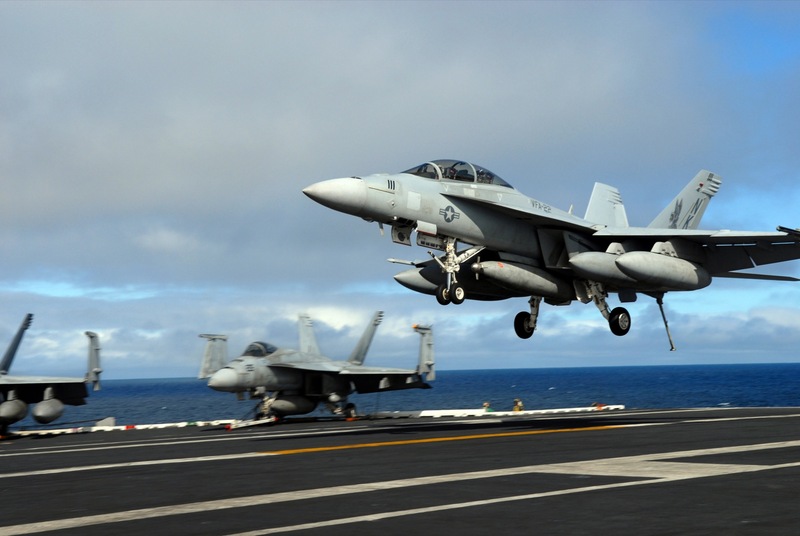 The amount of air needed to generate lift depends on the weight and dimensions of the aircraft, but the catapults on an aircraft carrier, which are entirely steam driven, help lung fighters up to their necessary speed (about 170 mph) before the end of the runway. It takes that catapults only two seconds to do this. Usually, they planes don’t quite make it to their necessary speed, which is why you’ll see the heavier fighter jets dip toward the sea just after takeoff of an aircraft carrier. But don’t worry. There’s still 240 feet between the flight deck and the thrashing sea, which is plenty of room for the plane to gather the necessary airspeed to gain altitude. Of course, all of this is just for takeoff. How does a plane land on such a short runway? Oh, and you know how a flight deck may be up to 300 yards long for takeoff? Landing planes come in at a different angle, and they usually only have about 166 yards. When they lower their landing gear, they also lower a tail hook. The tail hook is just what it sounds like—a hook that protrudes down from the fighter jet and grabs the arresting wires that are stretched across the carrier’s landing deck. These wires are pulled tight and screech the aircraft to a halt on the flight deck. But what if the pilot misses the wires? Landing on an aircraft carrier is one of the most difficult things a fighter pilot may ever do, so there’s a good chance he may miss the wires. This means he has to immediately takeoff, fly a loop, and try landing again. This also means that fighters land on an aircraft carrier at a very high rate of speed compared to a normal runway. Which also means that as soon as the pilot hits the flight deck, rather than pulling his engines back or slamming on the breaks, he throws the engines to full throttle. Why? 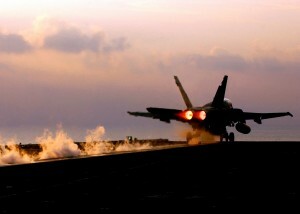 Because the moment he is signaled that he missed the arresting wires, he needs to be above his 180 mph to take off the other end of the carrier again. When an aircraft misses the arrest wire, it is known as a “bolter”. The landing deck of an aircraft carrier is slanting upward at a 14 degree angle from the rest of the aircraft so it can assist bolters in quickly getting back up to a safe altitude after missing the arresting wires. Unfortunately, the F/A-18 has no weapon systems … I’m just kidding. But seriously. The Hornet comes equipped with a nose-mounted 20 mm M61 Vulcan gatling gun that houses nearly 600 rounds. The F/A-18 can hold up to nine missiles: two on the wingtips, four under the wing, and three under the external fuel tank. If you see an equipped F/A-18, it may be carrying Hydra 70 or Zuni rockets, or it may be equipped with AIM-9, AIM-132, IRIS-T, or AIM-120, AIM-7 or AIM-120 air-to-air missiles. There are also five types of air-to-surface heat-seeking missiles that the Hornet may be carrying, or a few AGM-84 Harpoon anti-ship missile. You think that’s all? Of course not. The Hornet can also be used as a bomber. 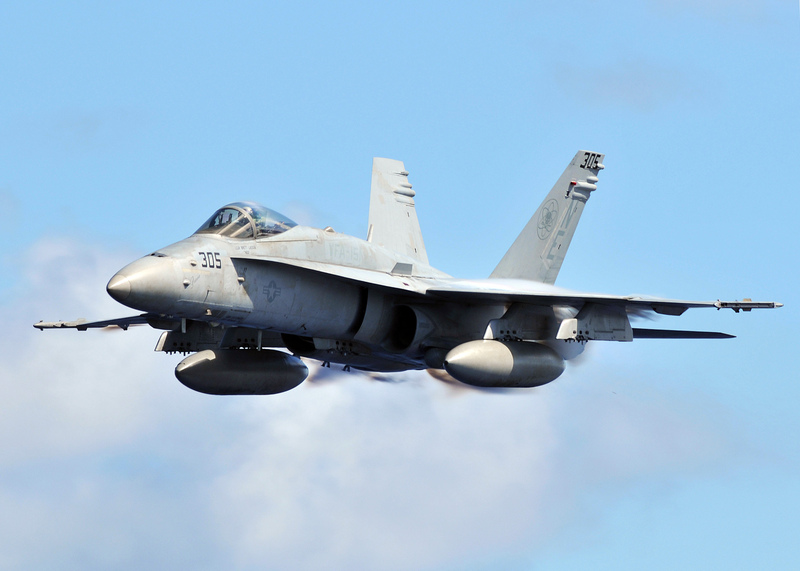 The F/A-18 can carry up to eight different types of bombs, including Paveway laser-guided bombs, cluster bombs, JDAM precision-guided bombs, B61/Mk57 nuclear bombs, and more. Boy, after starting with all the cool stuff, the history of the aircraft seems kinda bland, doesn’t it? If you answered “yes” to that, I question why you’re even reading blogs about airplanes … after all, without aircraft history, we wouldn’t be making bigger, better, faster, and more agile aircraft every decade. 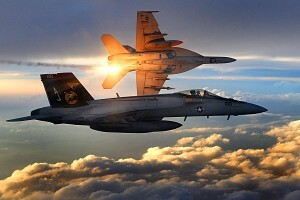 McDonnell Douglas developed the F/A-18 Hornet after gaining the contract from the United States Navy’s Naval Fighter-Attack Experimental program. The goal of this program was simple: create an agile aircraft that could replace the Skyhawk, Corsair II, and Phantom II, performing better in every respect than its fighter-series predecessors. Both the Navy and the Air Force needed a short-takeoff aircraft that was versatile enough to be used on a land-based air base or stored on and launched from an aircraft carrier. The Navy proposed a design for the aircraft that illustrated a single-man aircraft that could be easily used for bombing and could then defend itself from attacks while it returned to Home Base. 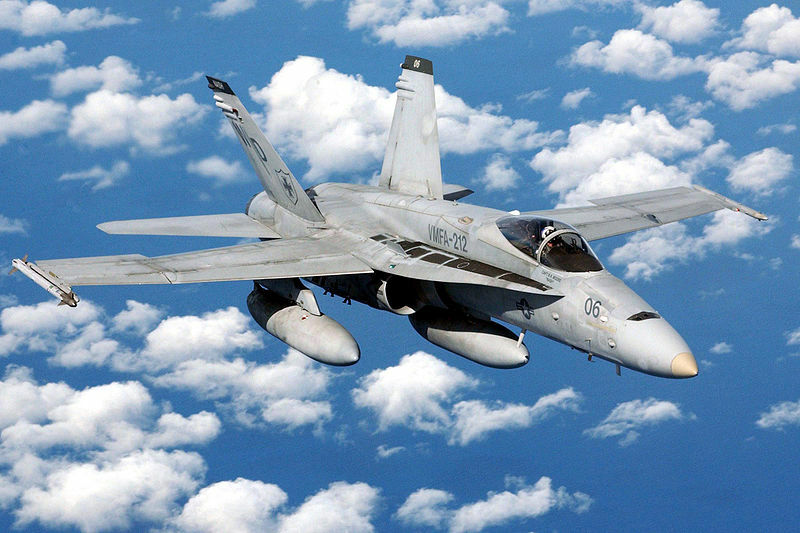 The F/A-18 certainly meets that goal with its superior dog-fighting capabilities, and it proved this ability in Operation Desert Storm, when one aircraft would dog-fight its way to its target, bomb the area, and return to base without a scratch. The F/A-18 was first tested in 1978 and entered the service in 1983. The F/A-18 Super Hornet, a two-seater variant of the Hornet developed by Boeing, was introduced in the early 1990s after the Navy retired the F-14 Tomcat, A-6 Intruder, and EA-6 Prowler all at once … without first considering an alternative (oops). A single F/A-18 Hornet costs just under $40 million. 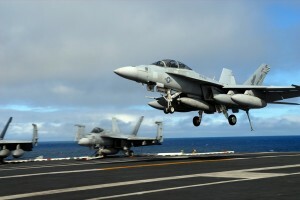 The F/A-18 Super Hornet costs nearly $60 million. The fleet size of the F/A-18 family is nearly 3,000 aircraft. Finally, let’s talk about the cockpit of the aircraft. Like previous military aircraft I’ve covered, the radio communications and control panel were developed by none other than Rockwell Collins (though, again, we never get credit for this on any of the Wikipedia pages). Last, but certainly not least, in the late 1990s, Rockwell Collins developed a technology that would automatically adjust engine thrusts in the case of a serious malfunction of aircraft damage. Originally, the functionality was intended to provide a safe landing for a fighter aircraft if it lost up to 60% of its wing, but the final program allows the F/A-18 to lose up to 80% of one wing and land safely! Now that’s impressive for an aircraft that may weigh up to 51,000 pounds when filled. Oh, and here’s a fun fact: though you may think of the F/A-18 as a “heavy” aircraft due to its many pounds by comparison to, say, you’re car, it’s actually classified as a light-weight fighter. In fact, when the Navy bid the program in the first place, a light-weight fighter was one of their requirements.